Since December 2015, my net worth has increased by 2.8% (not including my work DC pension). I’m not really hung up on this number but as it’s heading in the right direction, so I guess I’m happy. 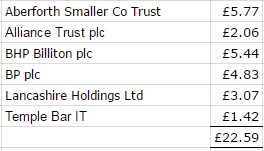 With markets bouncing back this month, plus the little extra from my bonus, my Future Fund now stands at £64,650.75. A total of £22.59, the lowest so far this year and although still a nice year-on-year increase, compared to last March’s £14.68, it was lower than anticipated due to BHP Billiton’s dividend cut. Growing dividends bit by bit! 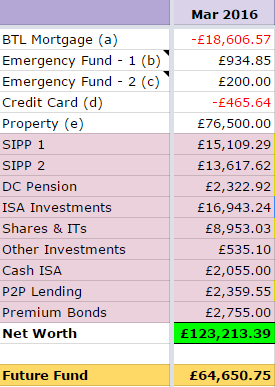 My goal of £720 in dividend income is looking rather ambitious right now, but let’s see how it looks in a few months time. Still, it looks like I’ve come a fair way since 2014! Other income I received this month included £26.88 from my eco investment with Abundance. I topped up my existing holdings in Aberforth Smaller Companies Trust and City of London IT and opened up a new position in F&C Commercial Property Trust. Still ploughing through the Game of Thrones books (am halfway through book 3, so another 500 or so pages to go! ), so not making any progress on my reading goals. As I threw a chunk of my bonus at my emergency funds, it’s looking like I will hit that goal. I won’t stop when I get there, I’ll continue to build it up bit by bit. I may have mentioned in comments on other blogs that I’ve had a go at matched betting many years ago and been stung. Whilst I didn’t lose a ton of money, I lost all the profits I’d made, largely through carelessness and over-confidence. After that, I stuck to normal betting/gambling but only small amounts. So although I’d been reading for months about people like Guy and TFS (and even Jim) ‘easily’ earning a few hundred quid from matched betting, I resisted the temptation. Until I was sitting on the plane on the way home from my holiday, trying to figure out how I could earn extra income to fund my future holidays. I had several options: Kindle publishing, selling stuff on ebay and matched betting. I figured out that the first one rewards fantastically, it takes up a hell of a lot of time; the second one would help clear out a load of unwanted items at home but the inconvenience of only really being able to post things out on a Saturday put me off. So that left matched betting. I won’t go into detail on what matched betting is all about as you’ll be able to find better descriptions elsewhere (like here) but suffice to say that in nearly 3 weeks, I made over £300 profit. Legally and tax-free. By matched betting standards, this isn’t a big sum at all – I missed out on a lot of sign-up deals as I already had accounts (seven, no less!) with many of the major bookies and also took no advantage of the recent Cheltenham festival. Still, I’m really happy with this sum, given the relatively small amount of time I’ve spent on ‘earning it’. I ‘lost’ a week while I waited for a new current account to be set up – that first week of matched betting, it was a bit of a shock seeing all those transactions on my main current account so I decided that I needed to keep the matched betting funds in a different account, which should be easier for me to control and keep track of. I also took advantage of some Topcashback* sign up deals during the course of my matched betting activity! Anyway, I intend to build up my funds before I start drawing any profits from it. It’ll be interesting to see how much I can continue to make via matched betting, especially as I’d only really be dedicating a little time in the evenings and weekends for it. All gambling websites are stopped by work’s firewall (rightly so) and I don’t get great reception on my mobile phone at work so I won’t be doing any during the day. Which is just as well, or I’d never get any work done! I will say though that matched betting is not gambling but neither is it risk-free. By risk, I mean risk due to ‘human error’, which can happen (and already has happened to me) if you rush things! Oh and it’s not ‘passive income’ either because you have to do something to get the income rolling in. It all gets easier in time I’m told but right now, I’m just taking things slowly so don’t expect there to be reports of huge earnings coming up through matched betting! A big thanks to TFS for helping me get on the matched betting path! Anyway, hope you all had a great March – the days (and the future) are getting brighter! This entry was posted in Blog Update, Dividend Investing, Funds, Investment Trusts, matched betting, Net Worth, P2P, Portfolio, Savings, Shares by weenie. Bookmark the permalink. Good luck with the match betting – I did look at the posts from the guys on that but decided I just couldnt be bothered if I am honest – seems a lot of work to learn and keep an eye on, something I cant guarantee the time for but I will watch with interest! Thanks. I mentioned matched betting to a couple of my friends who say they could do with a bit of extra cash but after explaining it to them, like you, they reckoned they couldn’t be bothered either! I’m not sure I’ll be raking it in but I’ll see where I can get with it! I’ve taken a few dividend cuts on the chin (including Tesco and Standard Chartered) – while I’m still accumulating and not relying on the dividend income, I don’t feel too bad and yes, will continue to plug in the money regularly. A great savings rate for the month and overall. The investing journey can be a roller coaster ride at times particularly with individual stocks. The dividend cut in BHP is disappointing but they are a massive company and will given time get back on track. I can fully understand the emotional pressures and how the main risk with matched betting is with ourselves. My inbox is full of promotions this morning. There must be a few hundred pounds worth. When I looked at a few of them I realised that I have not done any reload offers so for now I am ignoring them and working my way through profitaccumulators beginner offers. I am still waiting for the sting in the tail with matched betting as it seems too good to be true. One week in and I am several hundred pounds up, there must be a lot of people messing this up or not taking full advantage of it. I still have some sign ups to do but have moved onto accumulators, where I’ve had mixed success. However, things have slowed right down as I try to juggle my funds between bookies and exchanges – once my overall pot is bigger, I shouldn’t have this problem. For me, I think the only ‘sting in the tail’ with matched betting will be my own errors! Good luck and enjoy the rest of the weekend! It’s great to see the graphical representation of how your dividends are growing year on year, what a nice way to see how far you’ve come. It’s interesting reading about your return into matched betting, good luck with it. I’m a bit like London Rob at the moment – I don’t feel I have the time or inclination to have a go just yet, but I might be swayed in the future if I continue to see success stories like yours and Richard’s! If not for the holiday, it would have been a bigger savings rate but I’m very happy with 60.6%, as unlikely to achieve that again this year! I’ll continue to do the dividend graph on a quarterly basis – whilst the numbers are still small, it is good to see how far I’ve come in the last couple of years. For matched betting success stories, check out Early Retirement Guy, think he made over £2k in March! Hi Weenie, it will be interesting to see how you fare with the Matched Betting. I’m ticking along nicely enough despite being “gubbed” from three major bookies. This was really disappointing as I wasn’t – and am not – anywhere close to maximising their own promotional Free Bet offers! I reckon most people could easily make about fifty quid a week from Matched Betting without too much effort. (That’s once they’ve covered the initial sign up offers that really do give you a fast start to the activity.) Since December, I’m up around £1,500, a figure that I can’t quite believe myself. I’ve not cashed any of it though, and am not going to do so until my “anniversary” at the end of this year. Sorry to hear that you’ve been gubbed from some of the bookies. I’m keeping my bets pretty small and using accounts that I’ve had for years during my gambling days so hopefully, they’ll just see me as a ‘normal’ betting customer. That’s a tremendous amount you’ve made since December. I hope to be able to get into some sort of matched betting routine once I’ve completed all the initial sign ups but need to move my funds around. What kind of stuff do you normally do – horse racing or football? Most of mine is in the latter, but at some point, I’ll move onto the gee gees! Hi Weenie! I am also curious about Matched Betting and am going to take the plunge next month and see how it goes – I was just wondering, how much money do you need to have available to make say £500 a month? or even say £200 a month? – i think like you i’m not looking to make this a part time job and go crazy with it, but a couple of extra hundred quid a month would be very nice! As I’m not at the stage where I’m making £500 a month, I’m afraid I can only really guess that you would need a couple of grand to take advantage of high odds and lots of offers. To get my £300, I started off with a pot of around £500 but even then I found that I had to wait to shift my funds around. Certainly having a a larger pot allows you more flexibility and the ability to go for more offers at any one time. Your 2.8% increase in NetWorth is better than mine. Savings rate is far more important, and that is flying. Matched betting looks tempting, especially by the amount some people seem to be making. There must be a risk in there to lose your entire stake? If done properly, I can’t see there being a risk of losing your entire stake, although you will often lose a small amount in the initial bet but you should more than make up for it when you get the free bet. I pointed out one of the risks above, ie human error, which, if you are laying a large bet and you make a mistake, then that could prove costly although sometimes, it can be ‘fixed’ if caught in time. Another ‘risk’ is if, like in Jim’s case, your betting account gets cancelled/closed (or ‘gubbed’) – usually this happens if bookies believe you are just using their account for bonuses so sometimes, it’s worth putting a few ‘normal’ bets on, or just avoiding extremely large bets, although I guess this could be where the big money lies. Another great month Weenie! A savings rate of over 60% is exceptional! Congrats on the dividend income as well. 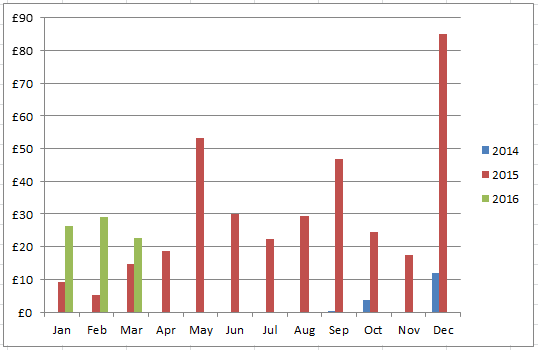 Looks like May, September and December are your big months so here’s hoping you hit your target of £720 for the year. Coincidentally, this is the approximate target of passive income I have set for myself this year. 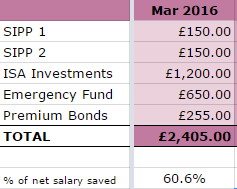 Money Grower UK recently posted…My 2015/16 ISA Portfolio Returns – Beating The Market! Thanks, it is exceptional for me and not likely I will achieve it again this year but I’m glad I did it the once! Well, last year, May, Sept and Dec were my big months but looking at what I will get in April, that will be a big one too so the graph will look a little different! Good luck with your £720 target too! Hi it has been so long since we last spoke. I just started Matched Betting this week but Im so nervous about it. I am taking advice from a site called Profit Accumulator although I have not signed up as a paid member there yet as I am still doing the free offers. Good to hear from you – hope all’s well with you. The main thing with Matched Betting is to take things slowly, follow all the instructions on Profit Accumulator and you can’t go wrong. In the early days, I made some errors from rushing but I’ve slowed right down now so profits are rolling in bit by bit. Good luck! Are you a paid member there? How many of the sites have you signed up too? Yes, I am. I take it you mean how many bookie websites I’ve signed up to? I was already signed up to 7 sites (from my gambling days) but I’ve signed up to a further 16 and I still haven’t done all the sign up offers yet. Impressive saving rate! I really envy you and the other bloggers who actually manage to keep track of things, it’s something that I always want to do and… NEVER GET AROUND doing it… Anyhow good numbers. May I ask you where I can find your holdings list (if you publish one)? Thanks – it was a one a lot higher than usual though, due to my bonus! I don’t mind tracking my investments and savings – I admire those bloggers who track every single penny as they budget – that’s not something that I would want to do! Thanks for stopping by and good luck with your investments! Wow, as Mr. Financial Zombie noted, you are killing it! Well done you. Nice work as usual weenie.